Those looking to erase the years without surgery or drugs can experience what the Chinese Empresses and Emperors did nearly 2000 years ago. Facial rejuvenation rebalances energy and reduces wrinkles, fine lines, puffiness and other signs of aging through acupuncture and Chinese medicine. Hair-thin filaments are applied to pressure points on the body and a single visit can lift drooping eyes, tighten pores and increase collagen production. Treatments are simple, virtually pain-free and require no incisions, which means no down time. Facial rejuvenation provides lasting, natural-looking results that will bring out your innate beauty and radiance. Wisdom steeped in the ways of the Ancient Doctors of China helped in the development of Acupuncture. The Ancients spoke of how the outside of the body reflects our inner workings. The results of cosmetic acupuncture reflect not only a change in external appearance, but also an improvement in total body wellness. The focus is to treat the underlying causes of aging and thereby encouraging a “graceful aging process”. Discover a beauty secret used by Chinese nobility for thousands of years. Now you can harness this time-honored wisdom to reclaim a radiant and youthful appearance and reverse the aging process naturally without cosmetic surgery facelifts, Botox, or anti-aging skin creams needed to achieve beautiful skin. The non-surgical Mei Zen cosmetic acupuncture procedure is a holistic, natural and comprehensive skin rejuvenation program designed to restore, rejuvenate and relax the mind. The Mei Zen protocol is based on Traditional Chinese Medicine that revitalizes and rejuvenates the face and body. 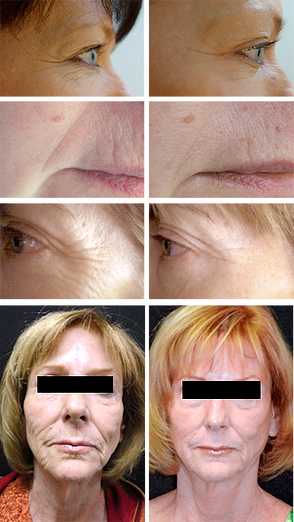 The skin is treated from the inside and outside, utilizing ancient techniques that is very superficial. Drawn from the ancient texts of Chinese medicine, the Mei Zen cosmetic acupuncture is a relatively painless, natural technique. Small, less than hair-width acupuncture filaments are placed in a precise configuration just under the skin’s surface to stimulate the production of collagen and elastin. It is an excellent natural alternative to cosmetic surgery facelifts and Botox treatments. Q. What is Cosmetic Acupuncture? A: The Mei Zen Cosmetic Acupuncture System is based solely on the theory and practice of Traditional Chinese Medicine. We believe that it is the perfect anti-aging medicine. External beauty is the result of becoming healthier on the inside. Achieving a more youthful appearance is accomplished in two ways: by improving the balance of Qi in your body and by bringing more Qi to your face. The Mei Zen Cosmetic Acupuncture experience is a relatively pain-free natural technique. Delicate, small, less than hair-width acupuncture filaments are placed in a precise configuration just under the skin’s surface to stimulate the production of collagen which increases muscle tone and elasticity. Q: What’s the modern scientific rationale for how Cosmetic Acupuncture works? A: Inserting filaments into the skin causes little micro-traumas that stimulate the body’s wound healing process. This wound healing process balances out the dispersal of collagen by encouraging fibroblasts (cells that form collagen and elastin fibers) to migrate to the treated sites and lay down new collagen fibers. That means that the skin becomes more collagen- and elastin- rich through the acupuncture process. New, younger looking, firmer skin is achieved. Q: Will I look younger? A: 90% of the women reported looking younger with one course of treatment according to a study published in The International Journal of Clinical Acupuncture. Q: What kinds of results could I receive? Q: Does Cosmetic Acupuncture provide any general health benefits? A: Good news-there is no downtime or side effects. There is no swelling, scarring or significant bruising. . Since MZ works to rejuvenate your face, neck or abdomen without any plastic surgery or potentially dangerous cosmetic procedures. And…it is very economical. Q: Is Cosmetic Acupuncture right for me? A: If you are in your thirties or older and want to look and feel revitalized while maintaining the essence of who you are, you are a good candidate for Mei Zen Cosmetic Acupuncture! What are the Benefits of Mei Zen Facial Rejuvenation? Rehydrates the skin’s external layers through stimulation of the secretion of the sweat and sebacious glands which encourages the regeneration of healthy skin cells. Helps exfoliation, aids the proliferation of new skin cells, increases nutrition to the skin’s surface, improves the quality of the skin and promotes a healthy glow. Allows healthy “breathing” of the skin, increasing the skin’s protective ability to ward off infections and clogged pores. Increases oxygen consumption of the skin’s external layer speeding up the release of carbon dioxide and nitrogen at the cellular level, helps to keep skin deeply clean; contributes to reducing the accumulation of excess oil on the skin’s surface. Stimulates the production of elastin and collagen proteins in the skin to reduce and soften wrinkles. Reduces and relaxes the tension in the nerves and muscles, improving the integrity of the skin resulting in improved overall facial appearance. Q. How successful is cosmetic acupuncture? A. A study published in the International Journal of Clinical Acupuncture showed that of 300 people who received facial Acupuncture, 90% saw marked results after one course of treatment. As with all Traditional Mei Zen Cosmetic Chinese Medicine treatments the system involves a gradual, healthful process that is customized for you. A. The most dramatic results can last anywhere from 18 months to three years. Some benefits may stay with you the rest of your life. Cosmetic Acupuncture repairs and restores the health and vitality that your skin enjoyed in earlier years. Time and gravity however, are inevitable and your skin may eventually become damaged again. To curb this issue , you can repeat the course of treatment and to maintain the changes that you have attained. How long your new look will last depends a lot on your lifestyle, and whether you are willing to address other areas that may need attention such as exercise, nutrition, and stress reduction, but at a fraction of the cost of other procedures. A typical protocol begins with a consultation to determine your overall health and if you qualify for the procedure. We will also discuss your goals and which procedure you may benefit from or which one you are interested in: Facial or Abdominal. This consultation runs 15-20 minutes and is Free of Charge. If you qualify for treatment, then a 1 ½ hour session is scheduled which includes a complete evaluation, diagnosis and overall body balancing treatment. We then schedule a course of treatments that run usually 2 times a week for 6 weeks. During this time, herbs and foods will be prescribed that are specifically tailored for your overall health and stated goals for facial rejuvenation. You will also be give home breathing/stress management techniques and recommendations for skin care. Cosmetic Acupuncture is a fun, luxurious, and pampering treatment that will yield true benefits. We offer special programs for wedding parties. Many celebrities such as Madonna, Prince William, and Gwyneth Paltrow have regular Cosmetic Acupuncture treatments.. TV News commentators, and real estate leaders, are enjoying the benefits of Cosmetic Acupuncture. We always recommend that treatments begin a few months prior to the wedding or event to allow for the treatment to reveal the changes that you will see. Mei Zen Cosmetic Acupuncture is featured in “O,” Oprah‘s Magazine. Click here to check it out! Dr. Oz lists cosmetic acupuncture as one of his Alternative Health Must-Haves. Click here to see the video. Dr. Andrew Weil gives the nod to cosmetic acupuncture! Check out his blog post here.